Stinson Street School is not the only example of Romanesque architecture in our neighbourhood. There was another. Built in 1897 by architects William and Walter Stewart, Hamilton’s Central Collegiate Institute was a beautiful example of Romanesque design. 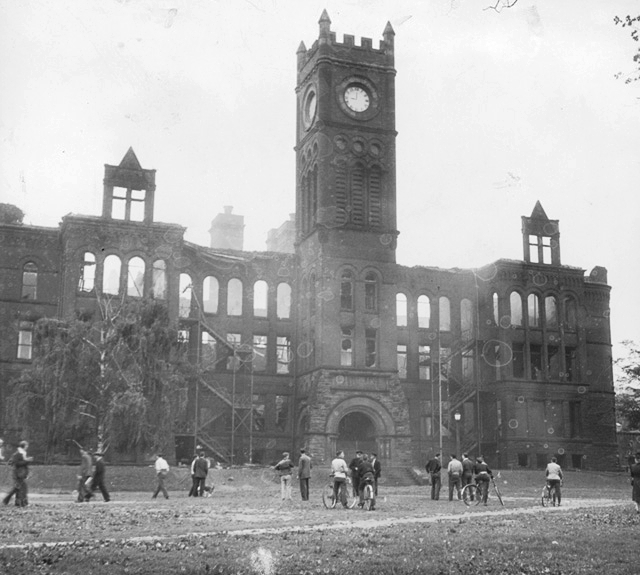 Tragically, fire ravaged the school in 1946. The first high school in Hamil-ton burned to the ground, leaving only the beautifully crafted gymnasium as a tes-tament to the past. At the corner of Stinson St and West Ave. S. stands the former gymnasium of Central Collegiate; a mere 3000 square feet in the shadow of the main school, which was 85,000 square feet. Now the gymnasium is a symbol of memorial for Central Collegiate, we know it as our friendly neighbourhood rec. centre: the Central Memorial Recreation Centre. The land plot was originally owned by the Wanzer family, which was surrounded by Hunter St., Victoria Ave. S., Stinson St. and West Ave S. The massive school sat facing Hunter Street with an open court at the rear, where the gymnasium was located. This impressive structure was built for a total cost of $155 thousand dollars. 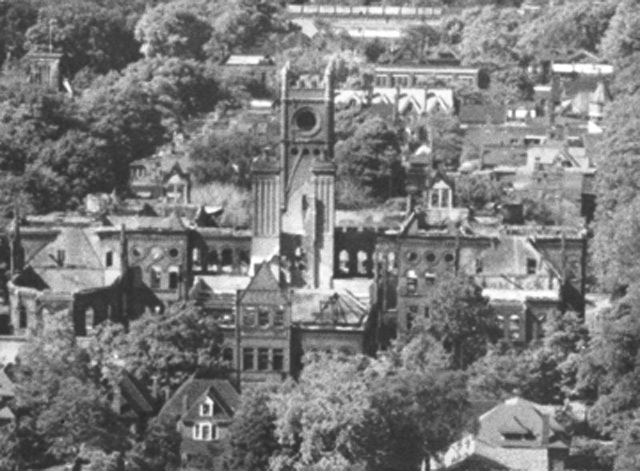 The clock tower was the dominant feature of the school, with a face on all four sides of the tower. A light-ning strike caused a fire to burn the tower down in 1941, sounds like “Back to the Future”. It was rebuilt a year later, only to be destroyed again on June 7th, 1946. In the northeast corner of the building (Hunter and Victoria) a fire blazed out of control by 11pm on that horrible night. Attracting thousands of spec-tators, the fire could be seen for miles. Although Fire Chief Sam Murdoch and his crew fought valiantly, they could only save the gymnasium. Arson was suspected. For two years the school gym sat neglected and empty. Local residents began to com-plain about the broken win-dows and litter at the site, plus the rain coming in the windows was buckling the wood floors: it was time to do something. The city pro-posed a park, which was ac-tually met with much protest from the neighbourhood. The gymnasium almost be-came an art gallery at one point. Finally, in the 1950’s the site was cleaned up and the gym used as a community centre. By 1963 the pool was added. dows were bricked up and soundproofing added. There was also an elevator added for friendlier access to all members of our community. You should take advantage of the programs offered there, it’s a beautiful modern facility with lots of history. There are many success stories of Central Collegiate graduates, Lester B. Pearson was one. 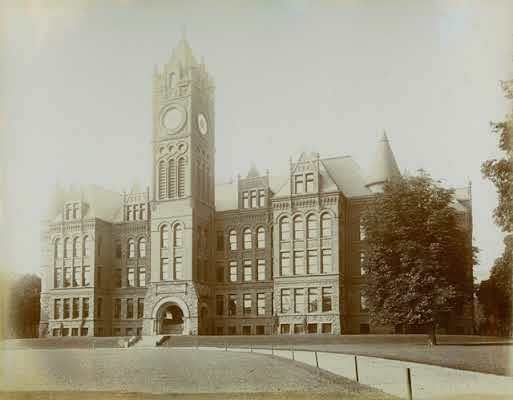 Plus Central Collegiate had a rich history involving the Arts. In 1910 a large portion of the school became the Hamilton Technical and Art School. Many former classmates are still around today and meet regularly to discuss old times. Reminiscing of a time when wars were ending, hopes were rising and Hamilton was booming. It was a pleasure to learn about their school and its history. If you are interested in seeing more photos you can visit the Hamilton public Library. It has a great Local History and Archives section, where you can learn about the history of your neighbourhood or even your own home. PreviousPrevious post:69 East Ave. S.NextNext post:A short story about 140 Stinson St.